State Representative Mike Zalewski joined State Senator Tony Munoz and a bipartisan group of colleagues from the House and Senate Tuesday to introduce legislation aimed at providing a reasonable set of standards for commercial ridesharing companies, ensuring public safety and protecting Illinois citizens. House Bill 4075, named the Ridesharing Arrangements and Consumer Protection Act, would require commercial ridesharing companies to have adequate insurance, contract with drivers who are appropriately licensed, use vehicles that are inspected for safety and serve customers with disabilities and in underserved communities. 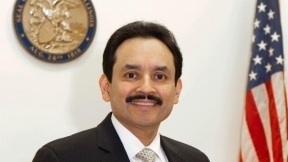 “Companies like UberX, Lyft and Sidecar have recently and aggressively entered Illinois to provide the same transportation services that have always required a chauffeur’s license and strict compliance with local public safety rules,” said Sen. Munoz, D-Chicago. “Right now, these companies are providing thousands of rides a day without adequate insurance to protect drivers and citizens and without any regard to the laws and regulations in the cities where they operate. “I have tried repeatedly to get some answers from the rideshare companies operating in Illinois, but at every turn, they have refused to cooperate with those of us seeking some basic understanding about how their services affect the safety of our streets,” said Sen. Martin Sandoval, Chairman of the Illinois Senate Transportation Committee. The Illinois General Assembly passed the Ridesharing Arrangements Act in 1983 to permit carpooling and other similar activities. The legislation was narrowly crafted to prohibit alternative taxi services or “jitney cabs” from operating in the state. Despite the narrow allowance for for-profit ridesharing activities other than those specified in the Ridesharing Arrangements Act, UberX, Lyft and Sidecar have been openly operating in the City of Chicago and the city’s affluent suburbs without abiding by any regulations.